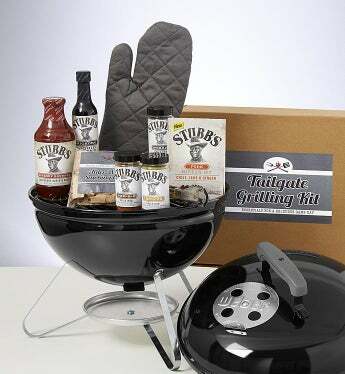 Your favorite griller will love this classic Weber Smoky Joe® Grill complete with a sturdy metal tongs, oven mitt, hickory wood chips, and these Stubbs® treasures: Hickory Bourbon Bar-B-Q Sauce, Pork Marinade Rub, Chicken Spice Rub, BBQ Spice Rub, Steak Spice Rub, and BBQ Hickory Liquid Smoke. Stubb’s® Bar-B-Q Sauces and rubs are a Texas institution. Stubb’s Legendary Bar-B-Q in Austin, is known for its live music, rustic atmosphere and authentic slow-cooked, hand-trimmed barbeque that has been making folks smile, satisfied and messy for decades. Grilling-On-The-Go has never been so easy! Tailgaters, campers, and back deck grillers alike will appreciate this gift.